I'll take everything in camel please, thank you! I have been obsessed with anything camel when I scored my favorite camel coat at the thrift store last Fall. I noticed that once I added camel anything to an outfit, it instantly takes the look from zero to one hundred (real quick: Bars). Ok that wasn't funny, but seriously if you don't own anything camel, you should definitely look into camel pieces to add to your wardrobe. 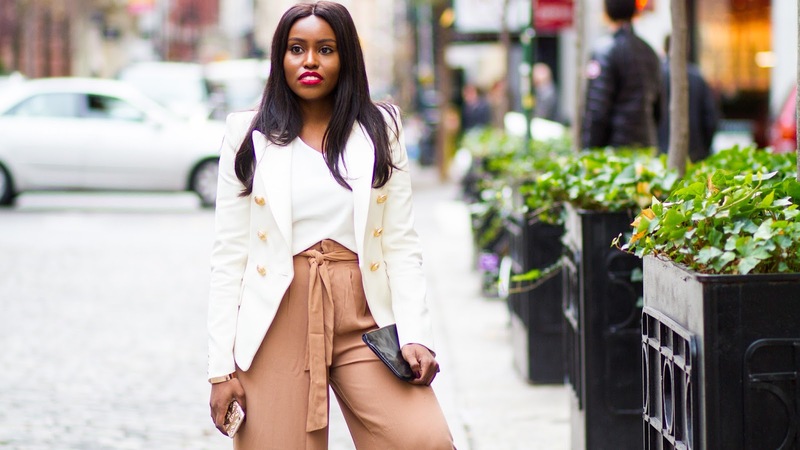 It is like white, it instantly make any basic outfit look luxe and put together. I scored this pair of flared camel trousers at Forever 21 for $24.80. It's like a chiffon material, very loose fitting. I usually get a size Medium or Small in Forever 21 Pants but I had to get an Extra Small in this because of the cut and loose fit. As you may know, I am 5'3 and I didn't have to do any tailoring or anything to it. I wore a really skinny heeled barely there sandals with it. I ended up tripping on the pants and the heels made a whole at the bottom of the pants. I would suggest pairing this with platform heels. If yo follow me on instagram, you know that I am obsessed with the Balmain pieces that I scored in the H&M Collaboration. This blazer was my favorite buy, why cause it's white!!!! I've been on a hunt for the perfect white blazer and I believe that this is the one. This outfit would make a great thanksgiving outfit, especially for my ladies meeting your significant other's family. Thank you so much for stopping by. Two posts in a row, how exciting!!! Hope you're all having a happy Friday!!! See you soon.